Moving day came and went, and we were all moved in. Now it was time to get settled! Well, first order of business? Showering. 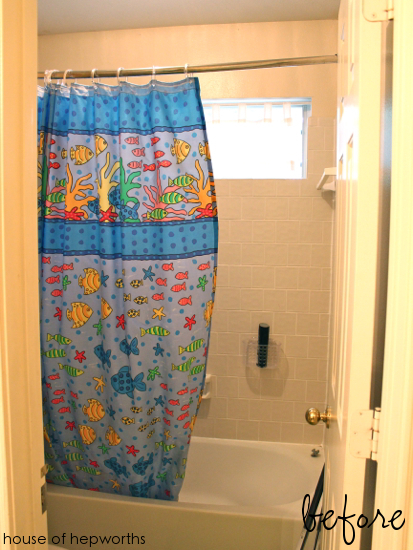 The previous owners left the shower curtains in two of the three showers (our master bathroom has a glass door, not a curtain). After assessing both bathrooms I determined that the curtains and rods had.to.go. The rods are those super nice ones that bow outward to give you more elbow room. However, these had seen better days and were ripping out of the wall. 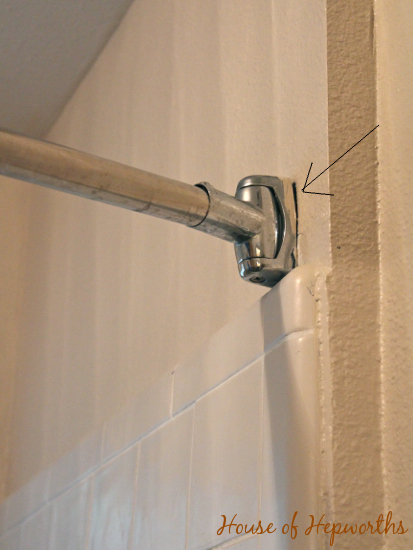 Plus, as much as people rave about this style of shower rod, I personally am not a fan because when you are in the bathroom or on the toilet, having the shower rod and curtain protruding from the shower makes me really claustrophobic. So, bottom line, I took them out and threw them away. In addition to my aversion to bowing shower curtain rods, I also realized that this one in the guest bathroom is hung obscenely high. I’m guessing this multiple shower curtain ring getup is to make the curtain longer and not just the curtain channeling her inner Mr. T? And then there was the issue of the showerheads. Well, I guess not really an issue, but the kids’ one kinda just creeped me out for some reason. The guest one seemed fine, but I figured if I’m going to switch one out I may as well do all of them. 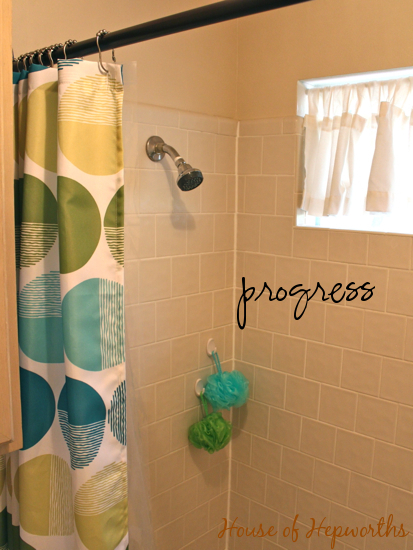 Plus, I have a very cheap, very favorite showerhead that I wanted to put in all the showers. 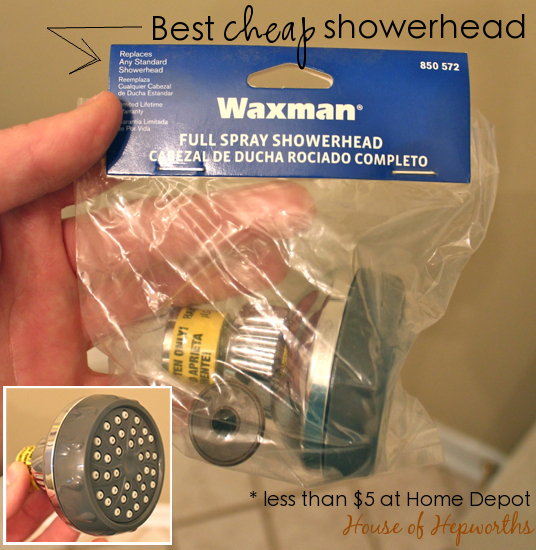 My friend introduced me to these cheap little awesome shower heads back in 2009. I’ve been a raving fan since. I even put them in my last house. These showerheads come from our local hardware store and are less than 5 bucks each. 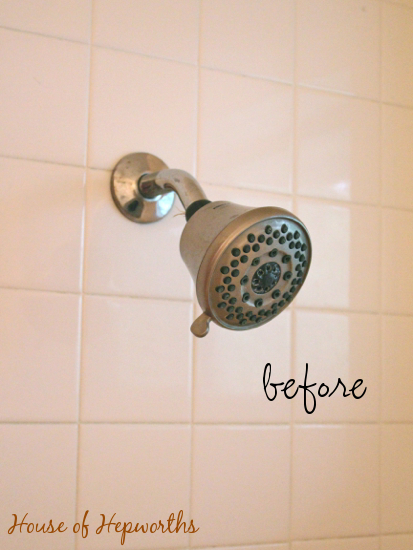 They are (obviously) not the top-of-the-line expensive shower heads, but for swapping out a cheap crappy one for a cheap awesome one, this is the way to go. As you probably noticed, I now have a straight shower rod in an oil rubbed bronze tone. I bought basic $15 tension rod shower rods for both bathrooms. Sometimes tension rods get a (probably deserved) bad rap, but these ones lock into place and are really tight. You basically twist them into place on the middle seam, and then one end twists for an even tighter fit. I got these in pretty tight and we haven’t had any issues with them so far. 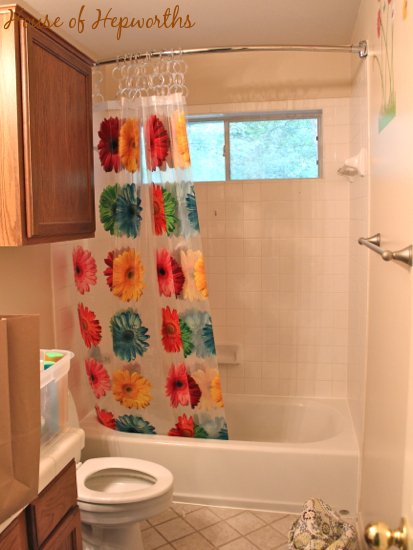 Here’s the guest bath with the new showerhead and shower rod. 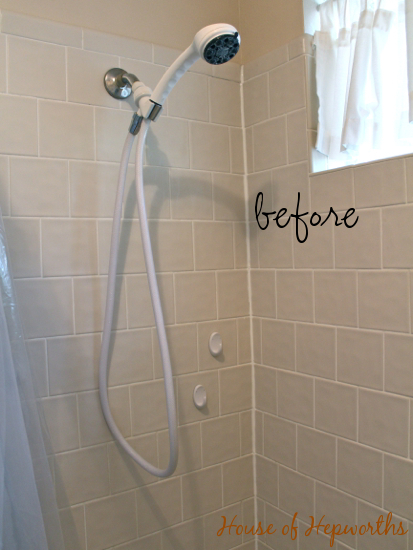 Check out what the wall color use to be behind the old shower rod. Yikes! 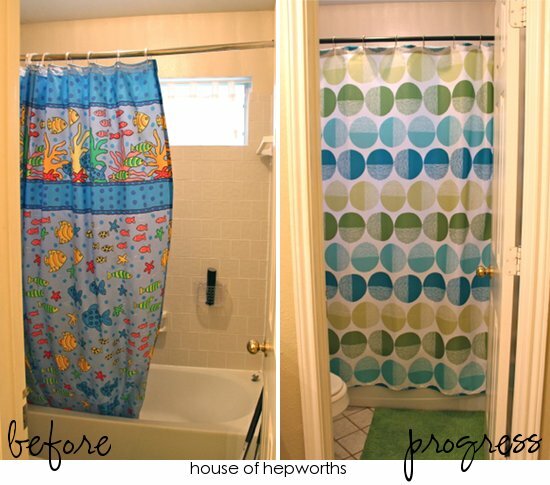 With my shower curtains from my previous home hung, and a new rod installed, the bathrooms are feeling just homey enough now that we can all shower comfortably. Of course, this is also after a ridiculously deep cleaning of all bathrooms on move-in day. No where near “done” but just getting the place clean and our own curtains hung really helped us all to feel more at home. So, I’ve been thinking about how I want to tackle this house from a fixing up and DIY perspective. I have decided to work on the house in phases. Phase 1 will be devoted to just getting this place feeling like a brand-new, but builder-grade, house. I am going to focus on getting every wall painted, every square inch scrubbed, every flush mount ceiling fixture (vents, speakers, recessed lighting) white (not beige), every window sill painted and caulked, every ceiling painted, and every broken set of blinds replaced. I’m already exhausted thinking about it! This house needs a lot of painting and updating just to get it to where I would consider it a good starting point for the really fun stuff like MOULDING! I want to feel like I live in a brand-new house, so if that means spray painting some air vents, painting some ceilings, and swapping out some ceiling fans, then that’s what I’ll do. So, for the next several months I will be working on “Phase 1: Brand New Builder Grade”. That’s what I’ve dubbed it. 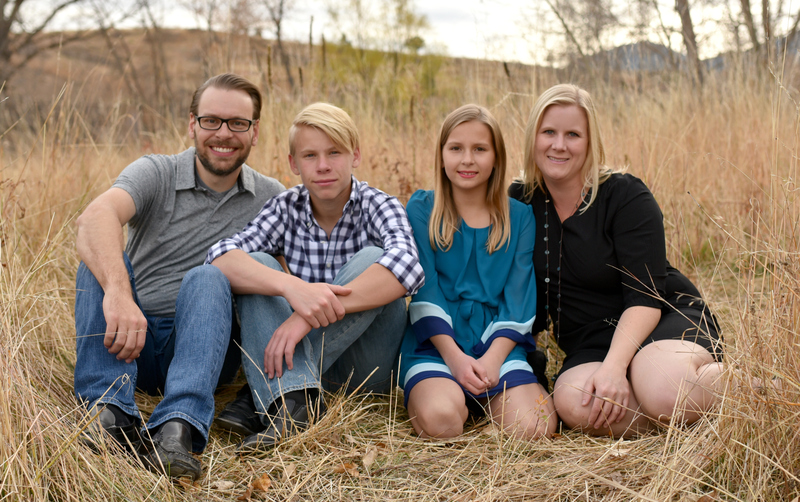 Of course, at the same time I will be getting us settled in and unpacked, and will get rooms arranged and decorated, and pictures and shelves hung on the wall, so it should be fun for you to follow along. I’ve been mulling over paint colors so I can tackle the bedrooms and I am really excited to talk about that next week! Anyway, I’m getting ahead of myself. I’m just so dang excited to tackle this house and make it our own. Thanks for following along on my DIY journey! I had a similiar plan for updating my home to “new/builder grade”, and although I’m still working on that phase, I must say that it made a big difference in feeling comfortable in my home with a deep cleaning, fresh paint on the walls/ceilings, new fans, blinds, and new carpet. I’m sure it will work out great for you guys, best of luck! 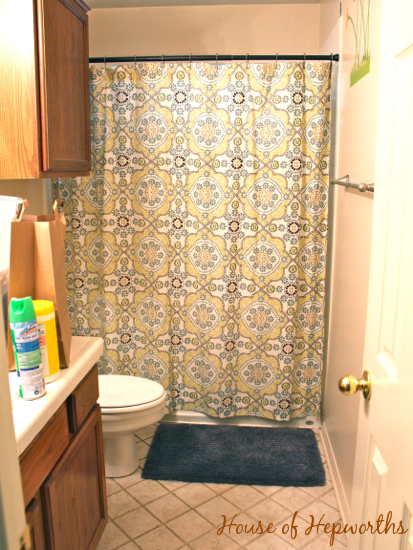 I love your shower curtain in the guest bath! Where did you get it? 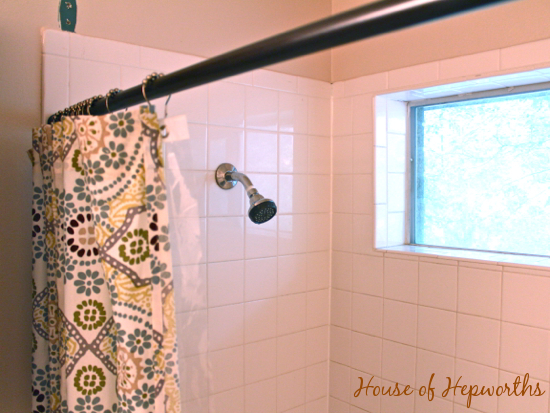 I totally agree…getting your own showerheads, curtain and a good scrub helps it feel like ‘your’ house! We always replace the toilet seat with a brand new one too. Even if there is nothing wrong with the old one…it has some other people’s b-u-t-t-s on it!! There is nothing like taking a shower and feeling clean when you get out!! You’ve done a great job making the bathrooms your own. 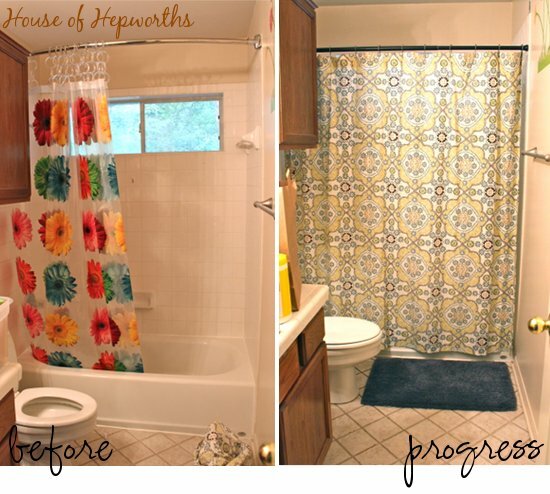 I chose the same shower curtain for my bathroom recently. And, I’m so jealous of the window in your bathroom lol. I know you’re gonna have a field day getting your new house in order!! Love the new look- I love making the house your own stage of just moving. It’s so exciting! 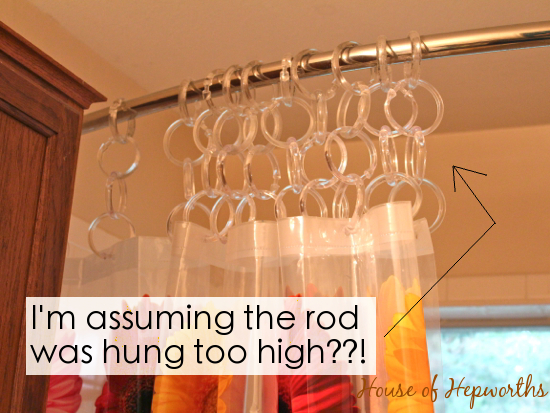 Also- I have NEVER seen the shower curtain rings like that! How, um, creative?? LOL. Guess they didn’t know about the extended length shower curtains! I think your “Deep clean/ settle in” plan that phases into comfy builder-grade is a great one! I did a similar thing when I moved into our last house that was built in 1974. The previous owners were English and had loved Laura Ashley floral pastels and liberally used them everywhere. Can you say wallpaper in EVERY room? Just getting things to a clean, blank slate helped me see the true potential of the house. I know you will, too! You’re doing great! just keep swimming, swimming! 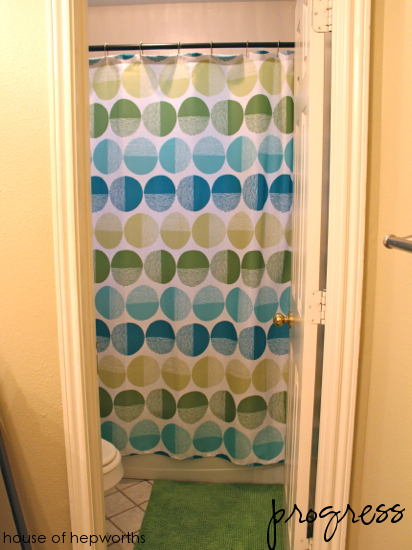 I’m not a fan of shower curtain rods either, so I used Ikea’s kvartal system to hang my curtains from the ceiling. With a double rail system, I can have a plain shower curtain and decorative sheers with tie-backs on either side to make it look really luxe. It looks so much better! Each time we do a military move I make sure to take our shower curtain, rod, and shower head instead of letting the movers take them because I never know what the people before us will have left behind. Using another persons stuff is gross to me. LOL So glad you’re getting excited about everything and looking forward to following along. Moving into a new house is to exhausting. I felt uncomfortable for weeks in our house because of the thought of other people living there before. I don’t know how some people buy already furnished houses! That’s so weird to me.